The hot and humid summers of Chicago make it quite easy for mold to grow, especially when heat waves trap the extreme temperatures inside the city with Michigan Lake nearby. The warm temps and high moisture content in the air make cause mold spores to quickly colonize in homes and businesses throughout Chicago and Naperville, which is why 911 Restoration of Chicago is always prepared to provide expert, mold removal services. The entire operation is licensed, insured, and bonded in both water cleanup and mold decontamination. By earning the IICRC MRT Certificate, customers can rest assured that the technicians we employ are experts at mold cleanup. 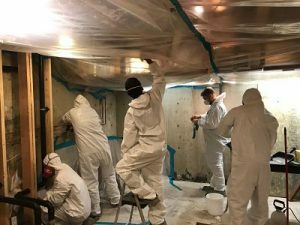 The IICRC is an organization of independent technicians and restoration companies that have come together to create the industry standard for how mold remediation and other disasters are conducted. 911 Restoration of Chicago is proud to carry all the certificates offered by this institute. So, call our qualified team when you find mold and mildew growing in your property, and we will be there to provide you with a free visual mold inspection today. Aside from the severe summer months, mold can find its way into your property in other ways. An internal leak can rapidly cause a mold infestation if it is not repaired promptly. Mold spores can begin to grow within 24 hours of being exposed to water when the conditions are right, and Chicago frequently has the right circumstances. It’s crucial to work with a restoration company that can handle both water damage and mold remediation. When you hire the technicians at 911 Restoration of Chicago, you will receive professional mold decontamination that will clear your property of any spores, as well as water removal to extract all excess moisture from the premises. Structural drying and dehumidifying services are crucial to mold remediation because even a minimal amount of moisture can create a rampant mold colony. To keep both water and mold at bay, the technicians will implement thorough water and mold cleanup services. Call 911 Restoration of Chicago if you notice signs that mold may be living in your property and you will receive assistance from a team that cares and understands your needs. 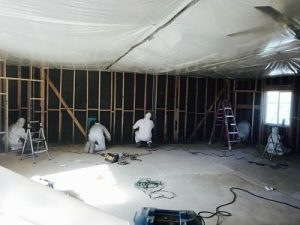 Since mold can be burdensome to your health, 911 Restoration of Chicago always moves fast when it comes to implementing mold remediation procedures. The technicians will take samples of the mold spores they find and send them to a third-party laboratory where they will conduct mold testing services to determine whether the species is hazardous. Allergy issues and respiratory issues are problems that property owners have to deal with when living with certain types of molds, but by extracting the spores as soon as possible, we can limit any health issues. Our mold experts will give you the peace of mind you deserve when you’re in the midst of a mold crisis. We are proud to keep the community healthy in the face of water damage and mold challenges. 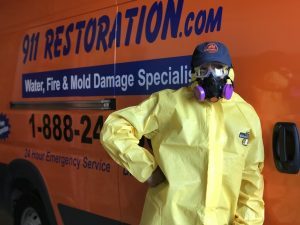 So, when you are ready for a Fresh Start, call 911 Restoration of Chicago, and we will provide the mold cleanup services to make sure your home is safe for you and your family.